This became an interesting chase day to stay the least. A potent trough was ejecting out of the Plains into the Upper Midwest with a significant speed max through all levels moving into Minnesota during the afternoon and evening. 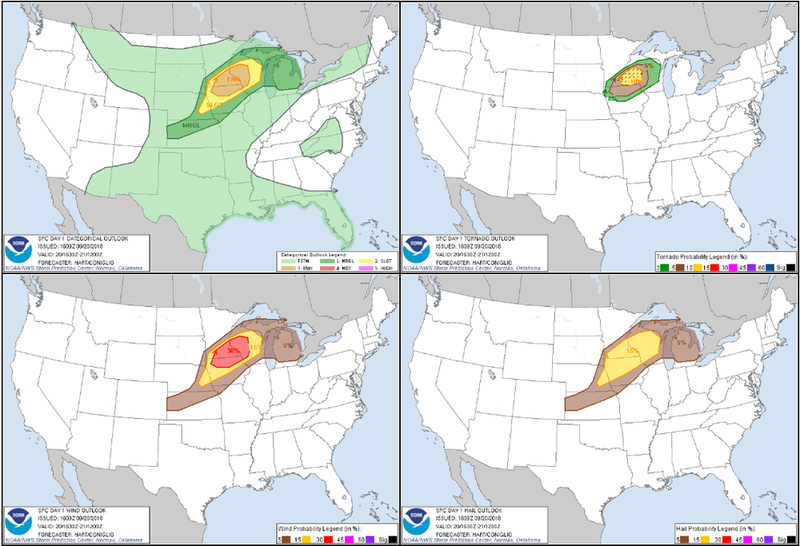 Models were indicating the potential for a broken line of strongly rotating supercells to break out ahead of the triple point and along a northward surging warm front into southern Minnesota by later in the afternoon. My thoughts were to get to southwest Minnesota to get on the initial storms and follow as they matured moving east-northeast towards the south metro of the Twin Cities. After leaving work at 2 PM, our team consisting of myself, Allan and Allison Persons, and Kyle Magnuson drove down Hwy 169 towards Mankato and then southwest on Hwy 60 towards St. James. Storms had already developed and were surprisingly congealing rather quickly to our west and starting to pick up some speed. We went south on Hwy 4 towards Trimont, Minnesota and waited here for storms to approach. A short while later, we realized the storms were moving at a really fast clip of 40-50 mph and not looking all that interesting, in fact forming more of a line than individual storms. One cell caught our eye to the east by Minnesota Lake that was ahead of all the other storms. We decided to blast east towards this cell to see if we could catch up as the storm intensified and to also stay ahead of the line quickly approaching to our west. We steadily progressed back up Hwy 60 towards Mankato to west of Faribault as the lead storm died and our line to the west started to show signs of rotation within individual inflow notches. We went north and stopped by the northern end of Roberds Lake to watch a mature mesocylone pass to our northwest. This area was later struck by a tornado that led to extreme tree damage and some structural damage to homes/cabins. 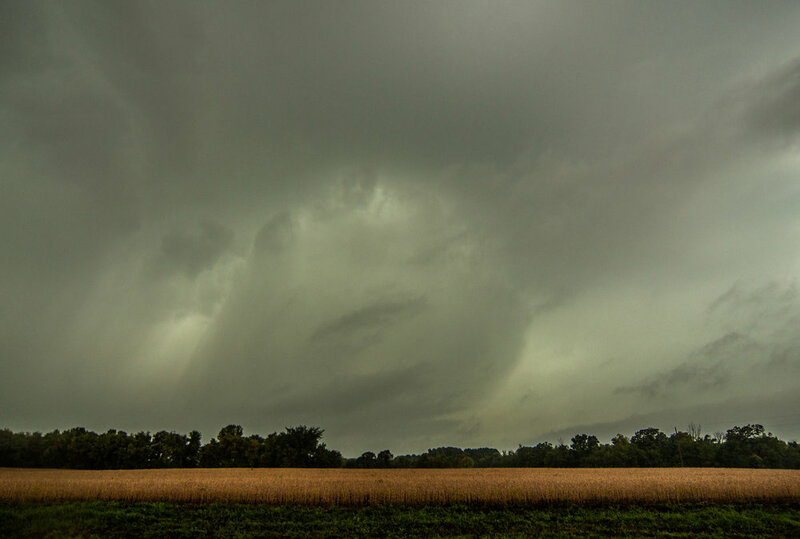 What I think was a large and mature mesocyclone looking west-northwest from the intersection of highways 68 and 69 near the northern end of Roberds Lake near Faribault, MN. 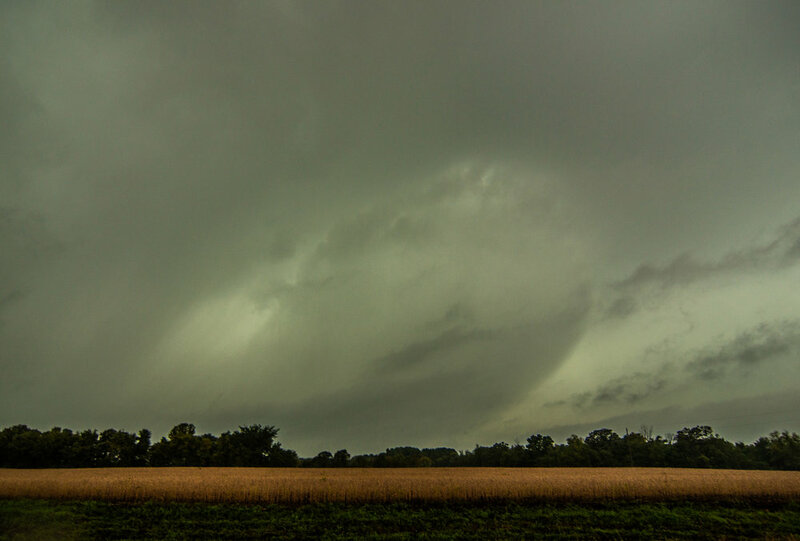 Another view of what I believe was a mesocyclone to our northwest within the notch of the storm. Would make sense based on radar imagery. I could not tell if this was rotating. Could have been an intense downburst? When we were re-positioning on Hwy 21 by the Faribault airport. Got slammed by intense winds ahead of an EF-2 tornado. Closed in donut hole just north of our location as we had to stop near the intersection of Hwy 21 and I-35. Strongly indicative of a rain-wrapped tornado that passed just to our north through the Faribault airport. Broad couplet less than 1 mile north of our location and another down by Medford. Circled in black are the likely tornadoes occurring at this point. Couplet as the tornado was passing to our northeast, just north of Dennison, MN. Zoomed out view of the quasi-linear convective system that spawned the 16 tornadoes across southeast Minnesota.